Podcast: Will US-UK Relationship Survive Trump? Donald Trump contradicts his Chief of Staff on immigration and The Wall and unsettles a GOP plan to avoid a Federal Government shutdown at the end of Friday. Trump began Thursday with a tweet challenging Chief of Staff John Kelly, who said the previous day — in an attempt to get a compromise immigration bill through Congress — that Trump had not been “fully informed” when he promised a 2,000-mile wall along the US-Mexican border. Kelly said that Trump’s position had “evolved” as he now favored a wall along part of the border, with other areas not needed such a barrier as they are impassible. A “person familiar with the President’s thinking” said Trump was furious when he learned of Kelly’s comments to the Congressional Hispanic Caucus. Allies further upset Trump by telling him of remarks which they said undermined him. Trump also used Twitter to put up a possible obstacle to a deal extending supplementary funding of the Federal Government past a Friday deadline. With Republicans in Congress trying to put together a package that would attract some Democratic support, Trump objected to the reintroduction of the Children’s Health Insurance Program. The Trump Administration and GOP legislators let the program lapse last September, putting into jeopardy coverage of 9 million children. Running out of funds, some states have suspended provision and others are likely to do so soon. Trump unsettled the negotiations for an extension last week with his provocative remarks on immigration, including his reference to people from “shithole countries”. Democrats want an agreement on protection of about 800,000 “Dreamers”, young undocumented immigrants, as a part of the extension. 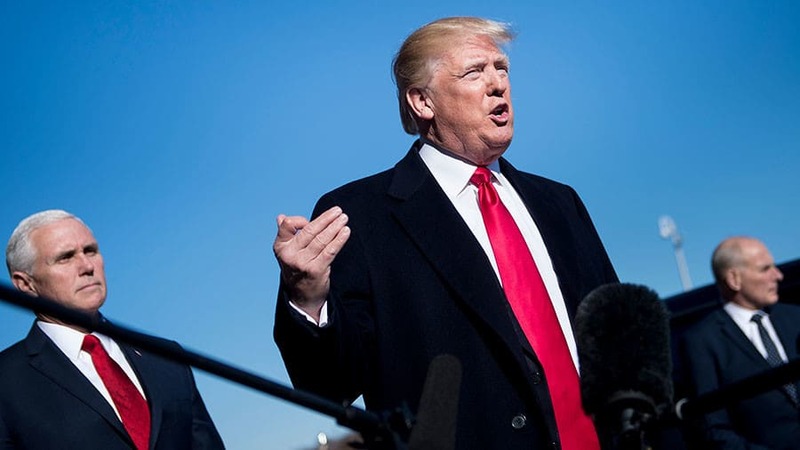 However, hardline Republicans and Trump are refusing any arrangement unless it also includes full funding of The Wall and an end to immigrants bringing relatives to the US. On Thursday night, the House of Representatives approved supplementary funding by a 230-197 vote. However, chances of getting 60 votes in the Senate — where the Republicans hold only a 51-to-49 majority — appear slim amid the furor over immigration and Trump’s remarks. Democrats are also seeking assistance to Puerto Rico, much of which is still without power four months after Hurricane Maria and a stronger Government response to the opioid crisis. The House measure overcame Trump’s objection to provide funding for the Children’s Health Insurance Program for six years. Meanwhile, it delays or suspends some taxes imposed by ObamaCare. The FBI is investigating whether a Kremlin-linked banker funneled money to the National Rifle Association to help the Trump campaign. according to “two sources familiar with the matter”. Investigators are examining Alexander Torshin, a former member of the Russian Senate and the deputy governor of Russia’s Central Bank. He traveled to the NRA’s annual convention in Kentucky in 2016 and briefly Donald Trump Jr., although he was unable to see Donald Trump Sr. and could not broker a meeting between Russian President Vladimir Putin and Trump Sr.
A leading figure in the party of Putin, Torshin has been investigated for money laundering in Spain, running funds for organized crime through properties and banks. Spanish investigators describe the banker as a godfather in a major Russian criminal organization called Taganskaya. In late 2015, Torshin hosted two dinners for a high-level NRA delegation during its week-long visit to Moscow. Shortly before the NRA’s May 2016 convention, conservative operative Paul Erickson e-mailed Trump campaign aide Rick Dearborn about the possibility of setting up a meeting between Putin and Trump. With the subject line “Kremlin Connection”, Erickson sought advice from Dearborn and Senator Jeff Sessions, a top foreign policy advisor in the campaign. In February 2016, Erickson established a company with Maria Butina, a Torshin protégé. Trump Sr.’s son-in-law Jared Kushner reportedly blunted the initiative, turning down the proposal of a personal meeting between Trump Sr. and Torshin. NextBFBS: Will US-UK Relationship Survive Trump?